Don’t call me Betty….or Papa John either…. You know, I’m not a natural cook. I can’t open the cabinet or refrigerator, pull a few things out and make a meal. I have to have step-by-step, written directions and if it has pictures, all the better. That doesn’t mean I can make the recipe, only that I might attempt it if there aren’t too many steps and the pictures are easy to understand and don’t need much interpretation. In fact, the best thing I can make is a decision on what I want from the menu. So, when we started talking about pizza on the grill, I was a little skeptical. Pizza comes in a nice, large, flat box, steaming hot (or at least warm to the touch) and is delivered to my door by either a teenager. I tip them $2, they sneer at me, but they leave me with Pizza ~ one of the 4 major food groups. But I digress (and drool). Back to the grilled pizza. We bought Pizza Dough Balls (did you even know pizza dough had balls???) and the ingredients for lots of exotic pizzas, at least for us. We are a meat and cheese pizza kind of family. Sausage, pepperoni, a few onions and we’re done. But we wanted to expand our palate (doesn’t that sound fancy!) so we went all out ~ you know, chicken and bar-b-que, pineapple and ham, mushrooms and olives. So, I laid out the pizza dough ball to thaw this morning, thinking about which exotic pizza I would make tonight. Maybe BBQ Chicken ~ easy enough and not too unusual; we wouldn’t want to experiment too much the 1st time. Around 5:00 pm, I noticed this glob of live, breathing dough on the counter ~ wow, it quadrupled! It was moving and burping and getting bigger by the minute. Thought maybe I should go ahead and start this process and see what happens ~ other wise it might grow into something bigger than me and take over my kitchen. I cooked the chicken, added a few onions (really living on the edge) and BBQ sauce . Went to pre-heat the grill. Guess what? No gas in the grill. No problem, I am a woman of the 10′s (woman of the 90′s sounded so much better) and can figure this out! Let’s see….dough, lots of greasy dough, rising, breathing, living greasy dough. Yep, gotta do something with this stuff. And then it hit me! Right there in the middle of my kitchen is my oven! It’s almost like a grill, right? It has racks, just like the grill. It has a temperature gauge, just like the grill. It’s hot, just like the grill. I’m sure this will work. But just in case karma feels like slapping me today, I’ll put a piece of foil on the bottom rack. You know, just to be extra careful, not because there’s a chance this won’t work. Makes cleanup so much easier, too. Now I’m ready to grill my pizza dough and experience the thill of pizza on the grill. It’s gonna be so fabulous! I can’t wait! I have the pizza dough on a piece of well-oiled foil, ready to drop on the rack. I open the oven, and pull out the rack. Turning the foil over, I plop the pizza dough on the rack. Absolutely nothing happens. The foil doesn’t ‘easily pull off the dough’. Nope. In fact, I have to peel the foil from the dough. But not to worry, I’m still confident that at any moment, the dough will begin to rise, crisp and resemble a pizza crust. I was wrong. What happened is probably best described as a science project gone horribly wrong. Lucky for you, I thought to take a picture. 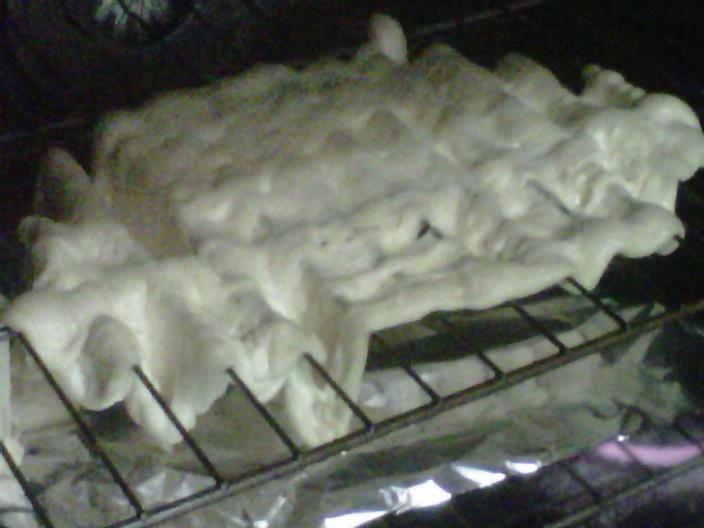 Just so you know, no matter how greasy the dough is, it doesn’t come off oven racks very easily. So, I learned that Delivery Guys and Gals are my friends. And I learned that pizza really is supposed to come in a box, slightly warm to the touch, at least to my house. Maybe you’ll try the grilled pizza and actually use the grill. It will be great, I’m sure. Really. Go ahead and try it. And let me know. Cause, you know, I’m that kind of girl ~ just love to take chances and try new things in the kitchen. I wrote this piece several years ago and just stumbled across it tonight. I could hardly believe I hadn’t shared it with y’all. And if I have already posted it here and couldn’t find it/remember, let’s just pretend like I haven’t, k? Oh! And thanks for hanging out with me! If you laughed when you read this (or at least when you saw the picture), share it with your friends. They need to laugh, too ! Previous The Cowgirl look is in, right??? Next Here’s 10 reasons I’ll never be Miss America! Lyn ~ i KNOW….and you know how I know? Cause I HAVE them. Yep…tons of them. But NO ~ I wanted to use the GRILL!! I am an idiot. Oh Sasha, you are toooooooo funny! but we all have had those kinda blunders when cooking. Whats worse is the damn clean up mess! lol…. I’ll share a funny one with you and the readers: many years ago Mr Wonderful wanted me to clean steamers, so i looked it up, filled the sink with water and cornmeal….left them there to soak, I come back and looked in the sink and their pissers were sticking out like three inches, squirting water!!!! I screamed, he came running….. Mr Wonderful finished cleaning them!!!! now they are bought from the fish store already cleaned.. ❤ ya to pieces! I was planning on making pizza on the grill for the first time too. Your “science experiment gone wrong” had me laughing before breakfast! Hey, at least you put the foil on the floor of the oven! Makes me think back to my first attempts at cooking and baking. Oh, better not go there. Susan ~ It was a sad mess 🙂 And yes….I was even WORSE in my early days! LOL! I’m sure mine would have made a major mess! I attempted a turkey on the rotisserie in the grill. I checked, not one place in the pages of instructions did it mention the wings get caught on the rack! I called it my Cajun Turkey……it was truly blackened! LOL! Tiki ~ Ha!! Who would know! I read the directions very carefully and STILL mess it up! !